Application Explorer in AX 7 allows easy filtering, which is extremely useful, because trying to locate something in AOT is what we do all the time (I really missed this feature for many years). It looks simple, but it’s very powerful, if you know how to use it. 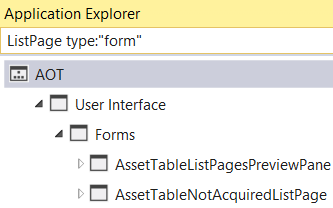 First of all, you can simply put a string in the search box on the top of Application Explorer and press enter. In AOT, it will show only elements with names containing the given string. You can also click the little drop-down arrow on the right and choose additional filtering options, such as filtering by element type or model name. 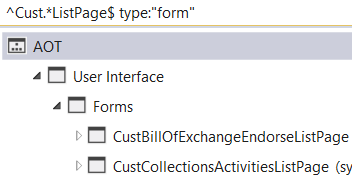 Using filtering by type:”form”, I’m now getting only forms with names containing ListPage. But what if you need some more advanced filtering, such as you want to find elements with names ending with a given text? Here is where it starts to be interesting. You can actually use regular expressions for filtering, therefore you can easily easily achieve that with ListPage$. The dollar sign means the end of the string, therefore only names that satisfy this patter are those containing ListPage immediately followed by the end of the string. Similarly, you can use ^ character to match the beginning of a string. 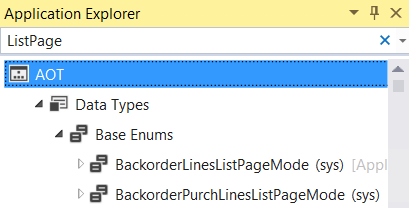 If you use them together to create a pattern like ^ListPage$, it will find only elements that are called ListPage. No characters before or after ListPage are allowed. 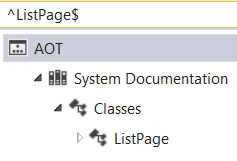 Only a single element satisfy this patter: the ListPage class. The dot means that there may be any character and * means that there may be any number of such characters. In most cases, this is all you need to know about regular expressions to compose really powerful filtering patterns. It’s surely no problem for any software developer. But regular expressions offer much more, if needed. Just to give you one more example, you might want to look for element names ending with numbers, such as Class1. Simple \d$ pattern will do the job. When writing more complicated regular expressions, you may find Quick Reference on MSDN very helpful. I said that I missed this feature for many years and indeed, I now use it all the time. I simply love it! 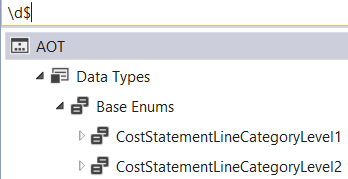 Thank you so much for giving a clear explanation on the topic connected with Application Explorer in AX 7. 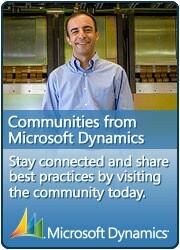 I think filtering feature is extremely useful for both beginners and more qualified specialists. It helped me a lot. How about the types? Is it possible to filter by “Table Field” name, method name? I don’t see a list of possibles types anywhere. 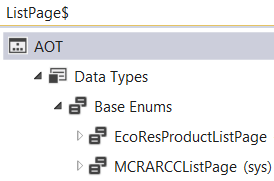 You can’t filter by these things in Application Explorer, but take a look at Metadata Search (in Dynamics 365 menu).